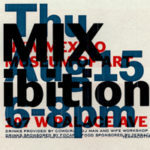 Drop your inhibitions of exhibitions at MIXibition on Thursday, August 15 when MIX storms the NEW MEXICO MUSEUM of ART with a carnival of culture, cuisine, cocktails, crossfades and competitions! Ooze into the open space of the historic museum courtyard and dip into the deep wonder of video projection works by Santa Fe native–and international artist–Peter Sarkisian. MIXibition will serve as a closing party for this rambunctious retrospective featuring decades of ground-breaking work by one of our own. Move, mingle and marvel to the music of DJ duo Man and Wife Workshop. Curl up at the cocktail bar by The Cowgirl BBQ. And, as always, fill out the MIX survey at the door (or right here: http://bit.ly/1cRm9XG) and get a FREE drink courtesy of FOCAP: Friends of Contemporary Art and Photography. Treat yourself to a FREE taste of the offerings from TerraCotta Wine Bistro, Santa Fe’s new savory sensation. The committed contestants of this year’s bizMIX competition will be on hand to pitch their big ideas and YOU will be choosing the crowd favorite. The winning business pitch will receive $500 in cold, hard cash and big ‘ol bragging rights heading into the final showdown. Someone’s gonna lose an eye. This month’s graphics by David Grey. Photography will be by Matthew Morrow. As always MIX is a private party and YOU and YOURS are invited! Free drinks and food are provided while supplies last.